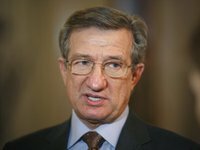 Non-aligned Verkhovna Rada of Ukraine deputy Serhiy Taruta has said Ukraine should not wait for Russian Federation President Volodymyr Putin to leave office before attempting to resolve the Donbas conflict. He said the Russian Federation is responsible for the war in eastern Ukraine, but that it is up to Ukraine to settle the conflict. On Tuesday speaking to Radio Free Liberty/Radio Europe, Taruta said many people in Ukraine mistakenly believe the conflict in eastern Ukraine will end when Putin relinquishes power and that's it's best to wait until then before taking steps to settle the conflict. "The West has big problems with Ukraine, which is doing nothing to make the Minsk peace agreements work. There is no progress in the talks. There is no desire to engage in concrete talks, since many in Ukraine are waiting for Putin to die or for the Russian Federation to disintegrate," Taruta said. The lawmaker said it is necessary for Ukraine to implement reforms and to ensure the consolidation of society today, and not wait for the end of hostilities in eastern Ukraine. But he said this is impossible when state officials continue to steel and profit from business related to the conflict.